Owning a business is a way of being self-sufficient and independent, and allows a degree of confidence in tomorrow. However, not all try to start a business, the reasons numerous: lack of starting capital, the risks involve, lack of knowledge in the field and many more. First complications arise at the stage of finding a business idea. One can choose any area for the business, but not all industries will be profitable. This article deals with one of the possibilities for staring a business. The reader can make a decision whether he or she possesses what it takes to implement the ideas in the articles into real life business. Contaminated diesel fuel: how can it be of profit? There are two points to consider. First, diesel is a popular fuel, used by agricultural and construction machinery, truck fleets etc. Second, the fuel can often become contaminated. To protect themselves from oil product shortages and considering the seasonal nature of their operations (such as agricultural), diesel machinery owners tend to stockpile fuel. Not all fuel is used here and now. Most of the fuel is stored in tanks until needed. This is when the interesting part starts for one looking for a business idea. In long term storage diesel fuel can become contaminated by dust and water. At certain conditions, microbial contamination is also possible. Using such product is not possible, since the engine and the components of the fuel system are quite sensitive to the various foreign substances. Failure of equipment requires costly repairs and causes downtime, which is always bad, especially so in seasonal businesses. Hence the need to purify diesel fuel before use. The standard filtration methods most often deal with but a small degree of diesel contamination. If the oil product is heavily contaminated and contains a lot of water, special large equipment is required. Not all own such machinery. Outsourcing the service is also not always an option, since the cost of processing relatively small batches of diesel is rather high. However, if the contaminated diesel fuel is purchased in large volumes and purified to good condition, profit is there to be made. Contaminated diesel costs significantly less than clean diesel, and this price difference is the way to earn money. The only thing left to consider is the technology process. What kind of equipment should be used? The best solution is a purification system and a blending system. Getting rid of contaminants is not enough. The product must be made ready for operation by adding special components into the fuel. Used oil removal of particulate matter, water and other contaminants, reduction of wax and sulfur content, removal of hydrogen sulfide and unsaturated hydrocarbons is the perfect job for GlobeCore’s UVR unit. This unit uses filtration and adsorption to clarify the fuel and bring it back to market quality. 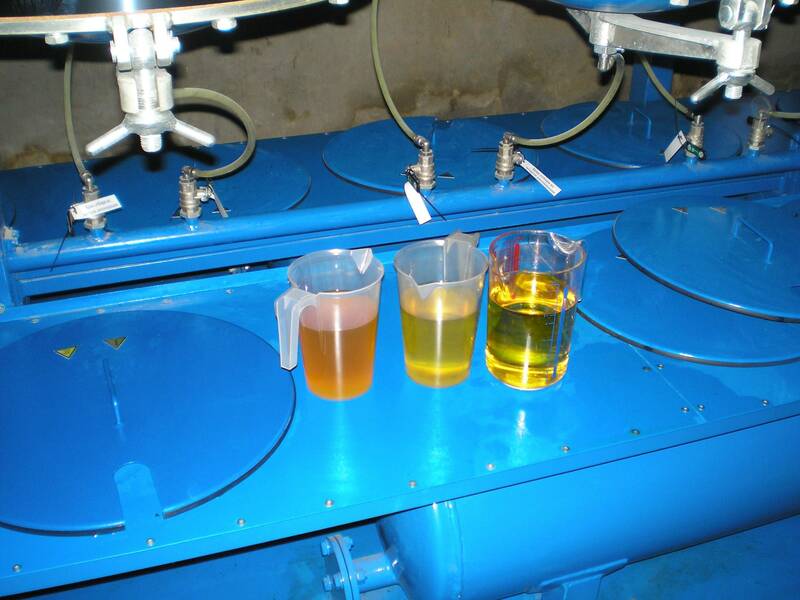 After UVR processing, the oil products do not oxidize and darken. GlobeCore’s equipment can easily be loaded onto a small truck, increasing mobility and providing on-site fuel purification services. It should be noted that the UVR units are multi-purpose and can be used with various oil products, such as heating fuel, mineral oil, gasoline, etc. Transitioning to a different product requires no additional setup, only the processing rate changes. As mentioned above, additive improve performance of diesel fuel. For instance, PPD additives improve pour point and filtration. While operating with large amounts of fuel, special blending systems should be used for injection of additives. Usual blending methods, in wide use at present, separation of diesel fuel into separate components often occurs. To remove that problem, GlobeCore manufactures the USB type units. By using the injection mixing method and the hydrodynamic shock, the fuel remains stable to separation for at least 180 days. Modern hydrodynamic continuous blending units have proven themselves in industrial applications to be reliable, precise and stable means of producing high quality motor fuel at optimal cost. The cost economy and increased profitability of the production process compared to the traditional methods of mixing component in tanks can accelerate the return on investment to up to 60% annually and make the project pay for itself within a year. However, the technology of the process is not everything. Diesel fuel consumers in your area must be researched. This research achieves two goals at the same time: learning where to buy contaminated fuel and who to sell purified fuel with additives to.